UK: Government policy is threatening investment in new wind power infrastructure following a record year for the industry, the UK's renewable energy association has warned. A record 2,611MW of onshore wind capacity was commissioned last year, representing an investment value of £5.3 billion (€5.9 billion) being retained in the UK. However, the UK government’s decision to block onshore wind from competing for new contracts means the wind-power industry faces a steep decline in new investment and newly commissioned capacity, according to RenewableUK. The government announced plans to end the Renewables Obligation support scheme earlier than planned in 2015. It then barred onshore wind farms from the UK’s second Contracts for Difference (CfD) auction in 2017, depiste having access in the first round. Onshore projects on remote islands have since been re-admitted. RenewableUK’s executive director Emma Pinchbeck said: "By excluding onshore wind from the market, the government is putting at risk billions of pounds of new investment annually across the UK and making it more expensive to meet its own climate change targets." In its report ‘Onshore wind: powering communities’, the organisation argued last year’s record installation figures were "largely driven by the deadline to accredit for the Renewables Obligation scheme". The majority of the 2,611MW of onshore wind capacity commissioned in the UK last year was installed outside of England: 1,673MW in Scotland, 356MW in Wales and 247MW in Northern Ireland. However, with onshore wind still barred from taking part in competitive auctions for support deals under the UK’s CfD scheme, RenewableUK expects capacity and investment figures for 2018 and 2019 to "drop sharply". The organisation also made the economic case for promoting onshore wind in the UK. This new capacity represented an investment value of £7.69 billion across the lifetime of these projects. Of this amount, £5.3 billion is retained within the UK, RenewableUK found. 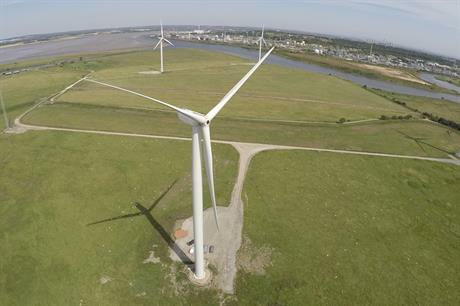 In June, a report by renewable energy consultants BVG Associates claimed onshore wind could be worth £1.6 billion to consumers as wholesale electricity prices begin to exceed subsidies. There is currently 19.3GW of installed wind capacity in the UK, of which 12.2GW is onshore, according to Windpower Intelligence, the research and data division of Windpower Monthly.